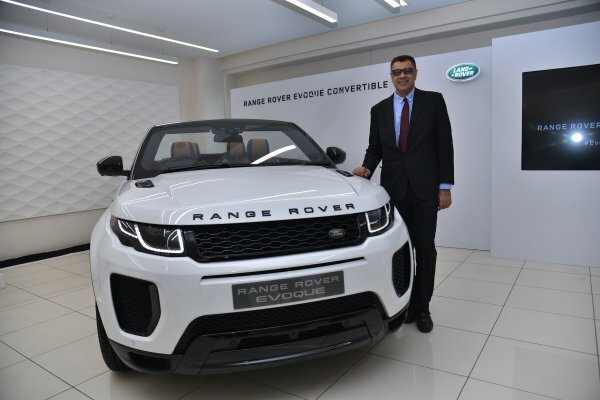 Jaguar Land Rover India has launched today Range Rover Evoque Convertible SUV. Priced at Rs. 69.53 Lakh ex-showroom, it is India’s first luxury convertible SUV. It is available in the HSE Dynamic variant and is powered by the latest 2.0 l Si4 Ingenium petrol engine producing 177 kW. This new SUV utilises a fabric Z-folding Convertible Roof System that lays flush with the rear bodywork for a sleek, uncluttered appearance when lowered. The configurable ambient interior lighting and the perforated Windsor leather seats ensure comfort and personalisation. Adaptive full LED headlights complement the vehicle’s design cues by combining a distinctive look with enhanced light output for better visibility and safety at night. Its ‘Torque Vectoring by Braking’ system enhances its agility and stability during cornering. The All-Terrain Progress Control (ATPC) is a state-of the-art system that enables drivers to set and maintain a steady speed in challenging conditions. The lightweight, compact 9?speed Automatic Transmission is extremely robust and perfectly complements the vehicle’s all?terrain capabilities. The Range Rover Evoque Convertible is equipped with a host of advanced technologies and innovative features. Head-up Display presents key vehicle data such as vehicle speed, gear position and navigation directions on the windscreen, without the need for the driver to take their eyes off the road. A range of additional services that further enhance the vehicle’s infotainment capabilities have been included under ‘InControl – Pro Services’. Advanced InControl technologies ensure seamless connectivity between the vehicle, your smartphone and the rest of the world. The Surround Camera System uses cameras placed around the vehicle to offer a near-360° view.